When helping your kids come up with a Father’s Day gift idea, why not have them make something at home? Father’s Day should be about expressing love and appreciation for the dads, granddads, step-dads or any other father figure in their lives. So have your kids give their father something truly special by helping them make a one-of-a-kind gift he’ll always cherish. This is a hugely popular activity and allows your kids to be as creative as they like. It’s something you can even give your own dad. Scrapbooking stores are everywhere and offer all kinds of accents that are sure to fit any dad’s personality. Use photos of the kids with dad (or you and your dad) from over the years, find old photos from when he was a child, or focus on a trip or experience that was particularly meaningful. The options are endless. Grab an empty can or basket and fill it with all of dad’s favorite snacks, such as peanuts, m&ms, crackerjacks, or things he’ll be able to use such as golf balls, tees or tools. On the outside, have your kids decorate it with images of things that represent dad. Another idea is to wrap printed photos of dad and the kids around it. Pick up a canvas apron, solid colored oven mitts, wood-handled grilling tools and fabric paints, brushes and paint applicators. 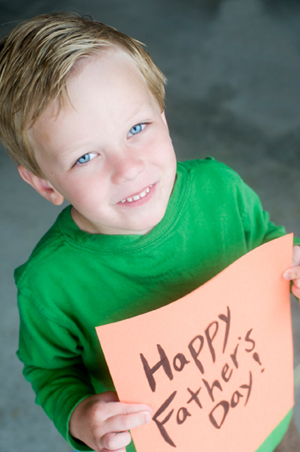 Give your kids the supplies and let them personalize dad’s gift by decorating it “#1 Dad” or any way they like. Set up a mini course in your backyard, or if it’s a rainy day, put it in your basement. Get creative by making holes out of cans or pails and have your kids decorate each one, making them fun and festive. Duplicate a real mini course by constructing a make-shift windmill, draw a castle on some cardboard and cut out a hole in the bottom or use toys and furniture to create obstacles. Your kids can use their creativity building the course and then enjoy some fun, quality time playing it with dad afterwards. Fold again along the diagonal line A in Fig. 2. Place an 8″ bamboo shish kabob stick from point C to D and tape it down firmly.